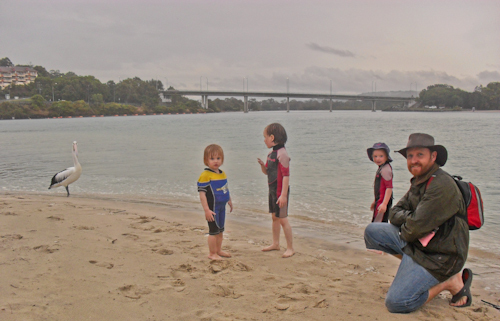 While I was busy attending workshops and talks at the unschooling conference at the Tallebudgera camping grounds, David was minding the three girls. 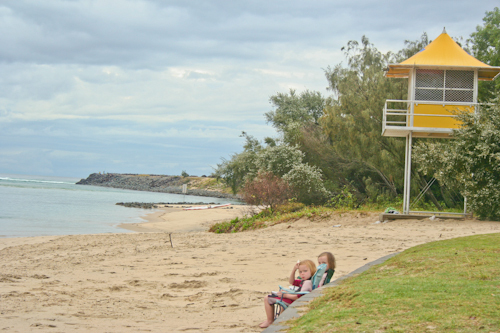 Of course, Tallebudgera is not a bad location to end up at if you have three small children. Really, it’s a huge playground. 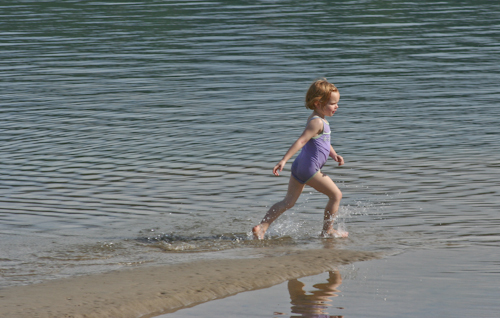 They took lots of walks along Tallebudgera Creek and other beaches. Brioni especially loves the water. 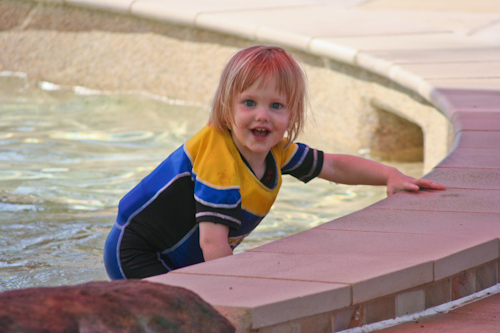 She loved the opportunity to swim every single day! Occasionally David brought the girls to the camping ground's pool for a more civilised swim. 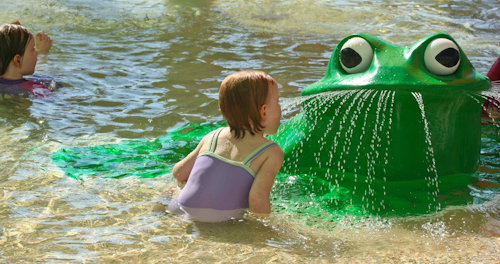 The pool was decorated with fun accessories, including this frog fountain and two slides. 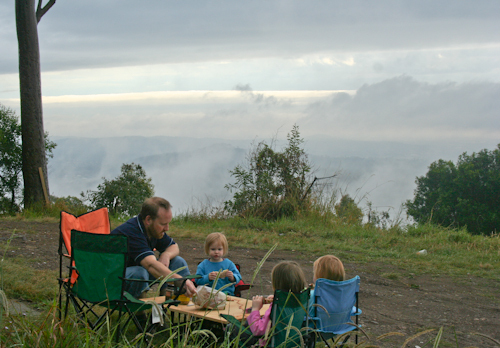 After sleeping one night in Mudgeeraba, we headed to the top of Mount Panorama for breakfast. 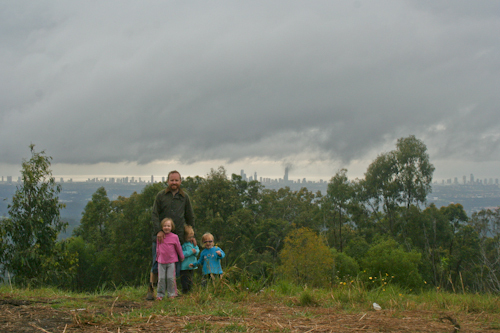 Occasionally the clouds cleared enough for us to see the Gold Coast skyline. 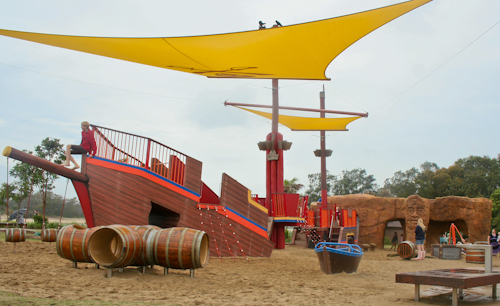 After breakfast, we headed to Palm Beach to check out the pirate-ship playground, one of the best playgrounds in southeast Queensland. Unwittingly, we arrived at the final destination for the Anaconda Adventure Race, so we were surrounded by cheering spectators and sweaty athletes! 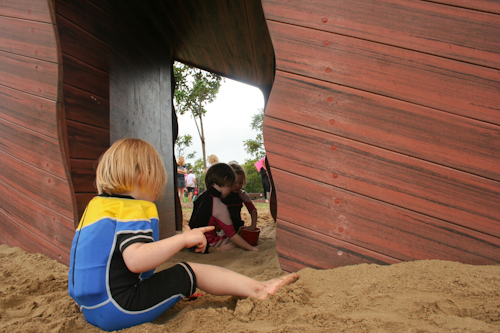 This playground took out a state award this year for play spaces. 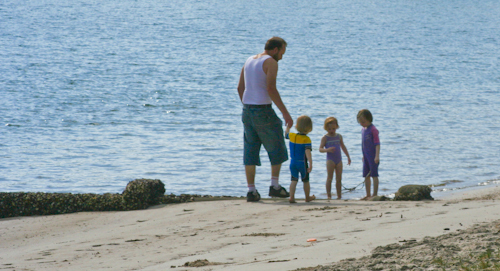 The girls looked for buried treasure in the sand. 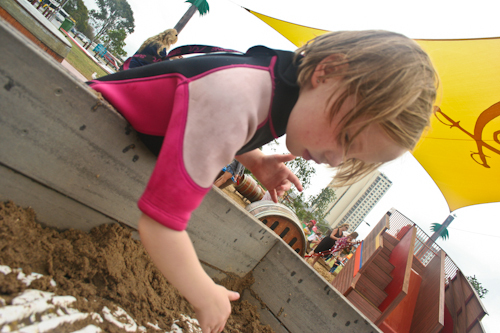 The playground is on the Currumbin Creek, so we alternated with playing at the playground and spending time down at the water. 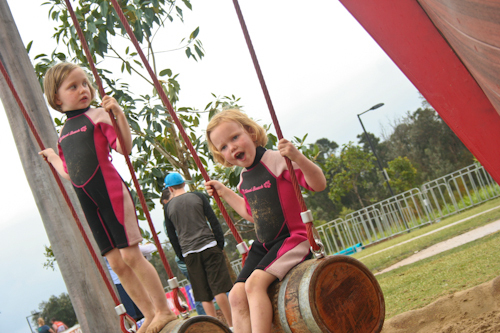 These swings were chained barrels that prevented full swinging but allowed a safe, swaying movement. The girls loved digging in the sand, with Aisha still intent on eating copious amounts of the stuff. Another morning, we camped on the shores of Tallebudgera Creek, and look how the girls positioned themselves to eat breakfast — what a view! David had a terrific time with the girls. They met and talked to many interesting people, and this lovely lady sent us some of the photos she took while they fed the pelicans. It was a fantastic time away. David loved his adventures with the girls, and I was refreshed and energised by the company of other passionate unschoolers. Our time camping in the truck also demonstrated that we can all sleep comfortably in the truck, and as soon as we returned home, the girls started requesting another camping trip — very soon! 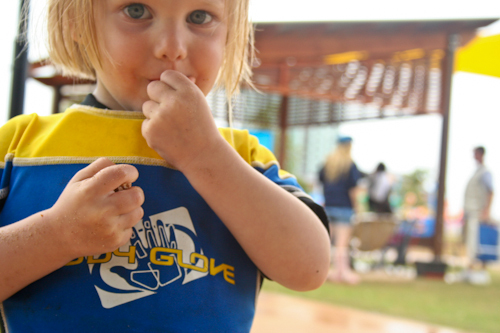 Previously... What does unchurching really look like?